Hi Roadies! It's Jocelyn on the blog today. When I opened my box with Winter-CHA goodies, I squealed when I saw the new Number Clips. I had been wanting to make a "reasons why I love you" album for my daughter, and the clips were perfect for a countdown of reasons. When I made this mini for the January CHA show, my daughter was nine years old, and so I made nine reasons why I love her. All of the pages were punched and hung on an IKEA frame. It's a little bulky! Except for the die cuts on the cover, I made all of the page backgrounds with paint or water. I kept the frame simple with a Felt Rose and a couple of the new Crafting Tassels. Since she was a baby, one of my daughter's nicknames is "The Bird." I layered one of the Resin Nesting Birds over a Tulle Mini Bloom and a Geometric Blossom die-cut. For each of the Number Clips, I painted them with gold gilding to give them a rose gold color. On this page, I stained and distressed one of the Wood Classic Tokens. This page is one of my favorites with the thick black paint, the beautiful vellum Geometric Blossom die-cut, and the pop of the pink Pretty Resin Bow. This page is most like my daughter--girly (but playing baseball). In addition to the Tulle Mini Bloom, I added a bit of Pearl Trim. The new Maya Road dies are so fabulous. Imagine the Peace die on a holiday card! For this Crafting Tassel, I dyed a white tassel with green spray mist. This page had a lot of texture, including the thick gold modeling cream on the Corrugated Kraft Post Tags. Rainbows are always good. :) For each color, I added an embellishment. I colored the Snow White Resin Mum with a couple of yellow-green Copic markers. 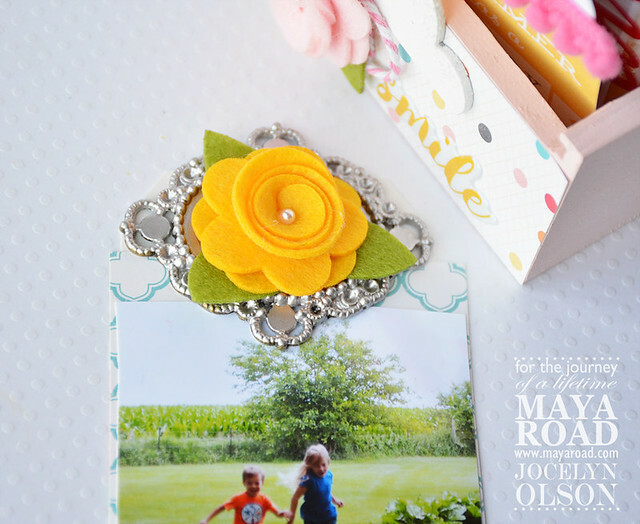 For the Sunny Day clip, I heat embossed it with yellow embossing powder. 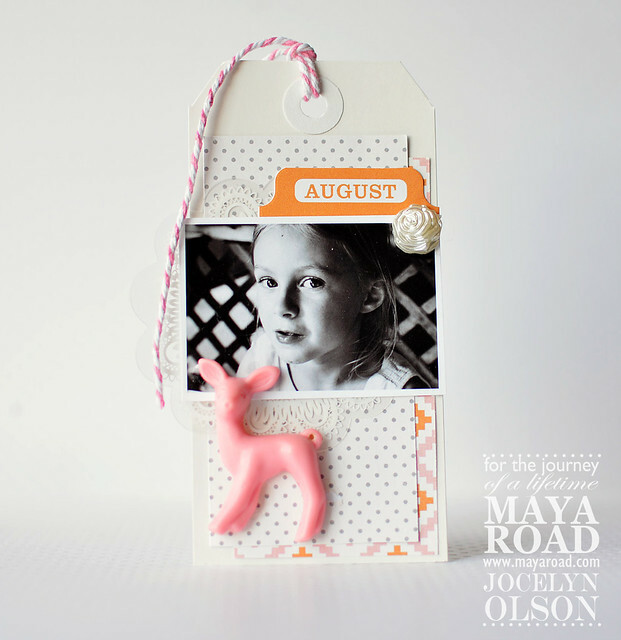 It's so much fun to alter Maya Road products! I mixed metal, wood, resin, and bling-y embellishments to match the journaling. The Resin Owls are so cute! Since there was a mix of embellishments, I opted to keep the embellishments monochromatic. I gilded the Number Clip and Bronze Music Note Charm and paired them with a Sparkle Sequin Bow. The vellum die-cut is from the Vintage Doilies die. I think the cool wood buttons may be from an upcoming release? (Shhhh!) I layered another Geometric Blossom die-cut from silver cardstock. For the final page, I layered a chipboard heart over the beautiful Wood USA Pieces. On the back cover (below), I added linen vellum Geometric Diamond and watercolored Make It Beautiful die-cuts over the black paint. For a final embellishment, I included a couple of the Small Vintage Paper Flowers--I've been using them on everything! Thanks so much for stopping by! I hope you're inspired to make your own countdown mini album. Hey there Roadies! 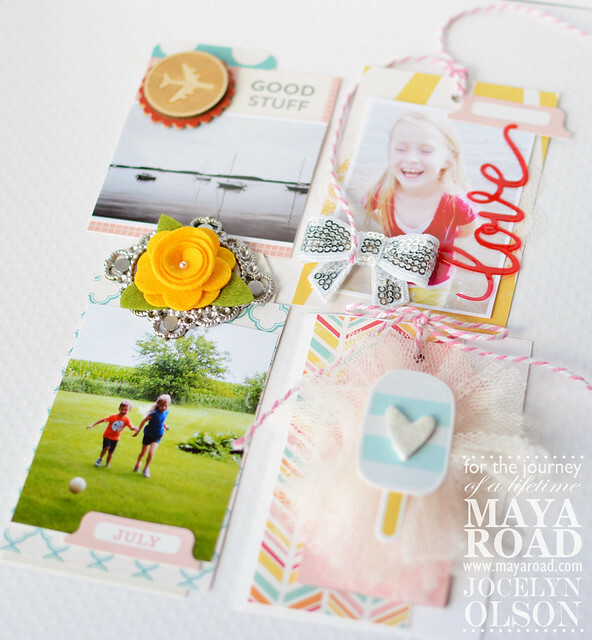 Are you excited about all the new Maya Road products that debuted at CHA this past month? 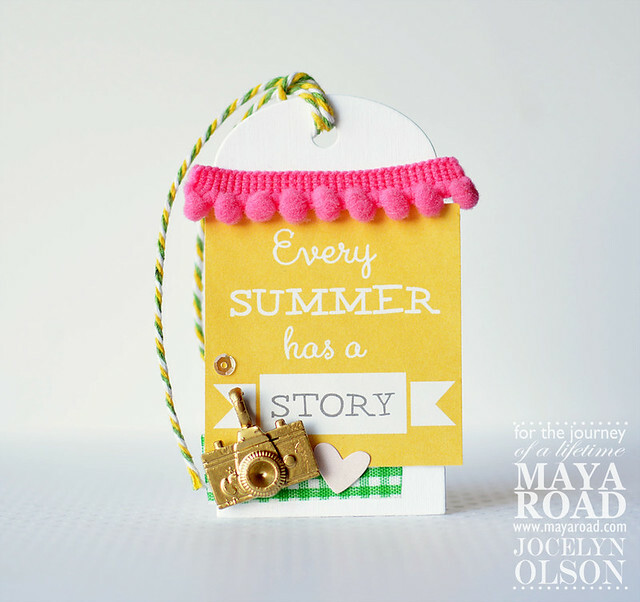 I know I am and I am here to share some cards with some of the new embellishments and I also used some of those new fun turquoise colored dies that Maya Road has been releasing. I decided to make a couple of cards, because I have some thank you's that I need to give to people for some gifts that I received. 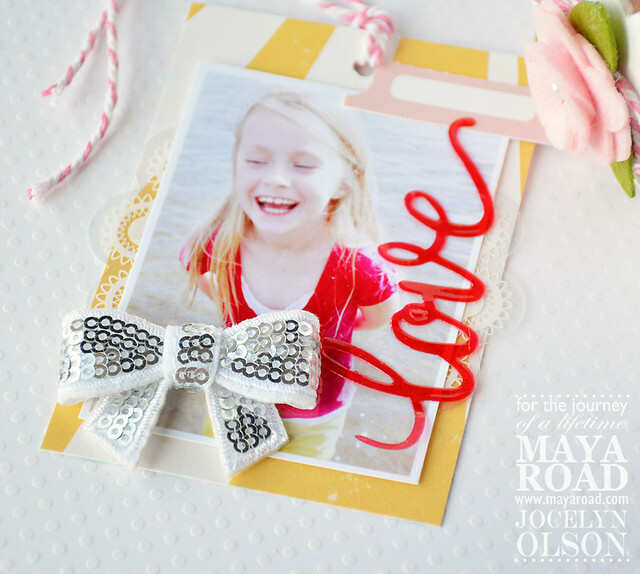 Maya Road makes it easy to make beautiful cards quickly, that anyone would love to get in their mailbox. The new "Tulle Mini Blooms in Teal (TK3274)" are one of my favorites, so I knew I wanted to use that pretty bauble on one of my cards. It was perfect to offset the Kraft Decorative Journaling Tag (K1199) that I placed my sentiment on. Use soft colors along with bold colors to create a softened effect like I did here. I used the "Fanciful Thank You" (DIE3146) for my sentiment. I die cut it twice out of contrasting paper and then layered slightly offsetting the layers. I love this technique for word dies to give them a little pop. My next card isn't quite as elegant, but more playful. At least that is what I thought while I was making it! Lots of fun Maya Road goodies on this to make it that way! I used the "Gift Tags" die (DIE3202) as my starting point for my little cluster on the left side of the card. This die is great, because it has a basic tag shape and then a smaller banner tag that you can use to accent. And did you see that tassel?? It's one of the new "Vintage Crafting Tassels in Milk White" (TAS3220). These are so fun and come in EIGHT colors! I am going to need a stock of these! And then I just topped off the cluster with that fun "Felt Rose in Milk White" (TK2968). Thanks for stopping by the Maya Road blog today. 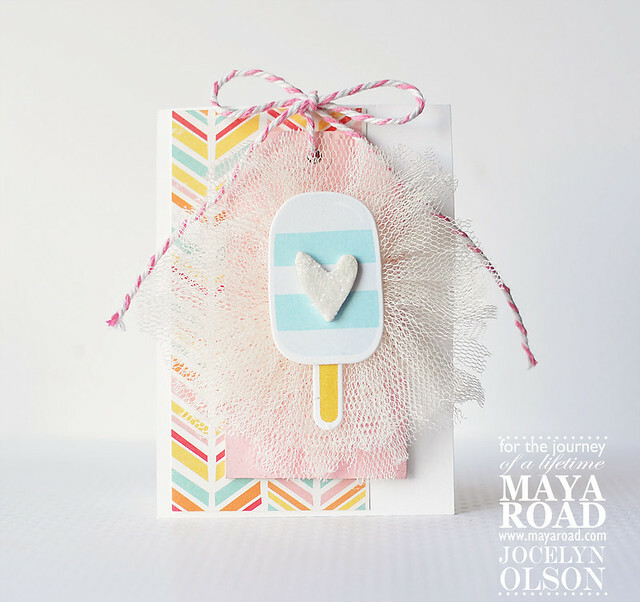 I hope I have made you want to get to your crafting area and create some cards with Maya Road products. Have a great weekend! "Kraft Decorative Journaling Tag (K1199)"
Hi Roadies! It's Katrina from Paper, Scissors and Glue on the blog today to share a layout with you. The main thing I LOVE about Maya Road products is they allow you to create, play and make your project YOURS! And that is just what I did with this layout that I am sharing today. AND there are a few new items from Maya that I used on my layout. We are excited to share these with you and you will see more coming soon! Some fun new corrugated kraft tags and mini clothes pins for starters. I painted this tag with gesso and then used a border punch on the end to make it a little more decorative. 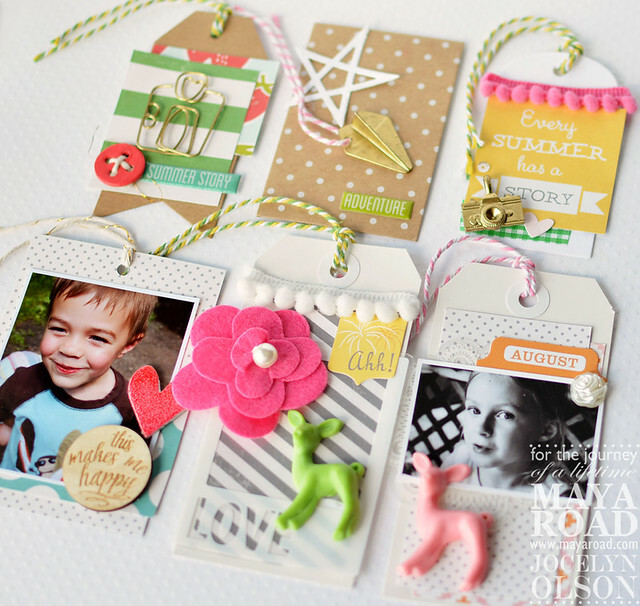 Add a fun wood token, with some other small embellishments and your tag is as cute as can be! I also took one of the transparent doilies and covered the back of it with some gold texture paint to add a little shimmer. I cut a kraft journaling tag in half and tucked it above my picture for my journaling. Those mini mini canvas pieces are so fun to make into any color that will match your project. I used a different color of gelato over each one and then used some water to spread the color around. Now we are to the title (and wait, there are some new products used!) and having fun with some chipboard letters. I love the "Lisa" lowercase alphabet set. I covered my letters with gesso first and then used the same gold texture paint on the letters that I did on the transparent doily to create a flow to the layout. See that "create art"?! Does it look like it was made with some dies?? 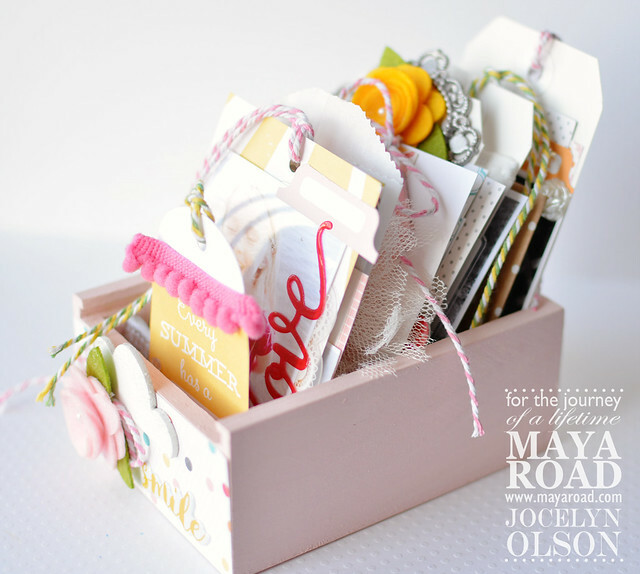 Yes, Maya Road now has several different dies for you to create with!! They cut all kinds of mediums wonderfully. Here I cut pattern paper and then also cut felt out to use as a shadow behind the pattern paper. These are going to get lots of usage in my crafting arsenal! Well, that's all I have for you today! And new Maya Road is a must have right?! Stay tuned for more new goodies to appear! ATC is Artist Trading Cards and some people actually collect these like some collection football cards etc. They are small and made in the size 2,5"x 3,5". I've made a little series of 3 here with some lovely Maya Road products. I've used Star tags, Light Bulb transparency's and a hello speechbuble on this card. I've also added some fabric tape in the background. Hey Roadies! Hope your summer (or winter?!) is going well. It's pretty hot here where I am, so it's fun to stay in and craft when the heat index is over 100 degrees! 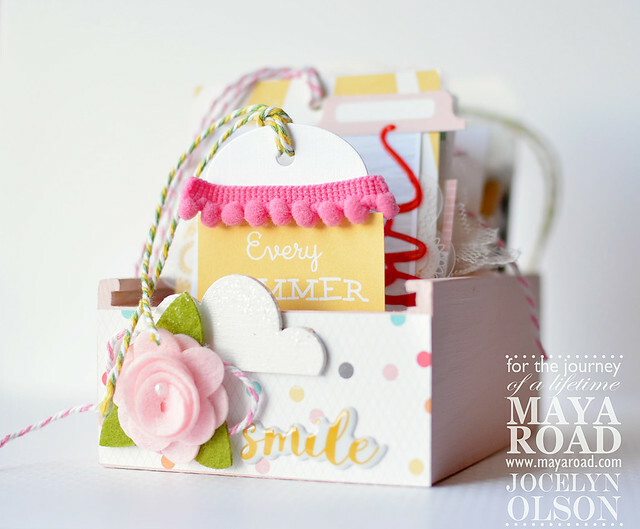 I have a card for you today using a lot of Maya Road goodies, including a piece from a canvas mini album! This is a rather large card, 5x7 inches, but it gives you a base with plenty of room to create with. I started by covering the card base with a sheet of pattern paper trimmed 4.75 x 6.75 inches. Then I went to work altering my Canvas Pendant Banner piece. You could do this with any of the canvas pieces, the heart or the star also. I covered the canvas with a thin layer of gesso, mainly because most of what I was working with was colored white, not ivory! Using washi tape, placed a stencil over it, taping the stencil tightly down. I mixed three different pink colors of gelatos and some water together to create a type of colored paste. Then using a stiff bristled brush, I painted and daubed over the stencil. Here is the result once I was done. Pardon the messy work mat, I am not sure how anyone keeps those clean, because I can't! And then some more fun layering embellishments together to create the focal point of the card. Using a kraft envelope, felt flower, transparent butterflies, framed saying and more. I ran some sheer ribbon thru the grommets of the banner piece and tied a bow. After a misting mishap (eek! ), I tied a separate bow and added it with the other one. Tucking some of the vintage trinket pins in behind the bows finished off that area. Thanks for coming by Roadies! There are some fun things in the works and we cannot wait to share! Hi Roadies! 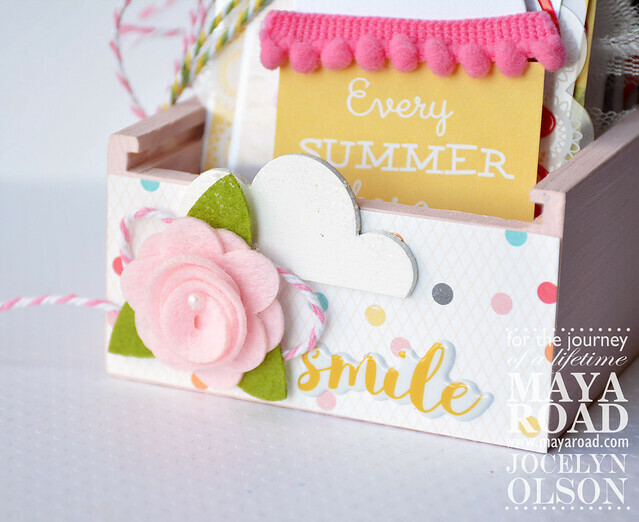 It's Jocelyn on the blog today with a non-traditional mini album. A few months ago, Caroline sent me a Wood ATC Box. There were so many possibilities for this box! I thought about using it for storing life cards, organizing embellishments, or using the bottom as a drawer for a countdown calendar. Instead, I settled on using the bottom of the box as a drawer mini album. I started by painting the box and adding a strip of October Afternoon Summertime patterned paper. The album consisted of pictures from last summer, so I kept the colors light and cheerful. I added a Felt Rose, a painted wooden cloud, and a loop of Pink Lemonade twine to finish the box. The album included a mix of tags, envelopes, a glassine bag, homemade cards, and a few loose pictures--basically, anything that would fit into the box. I gilded the Smile Camera Charm--isn't it cute? I also added the Mini Pom Pom trim and Leaf Gingham Fabric Tape on this tag. I'm addicted to these Sparkle Sequin bows! I want to put them on everything. I also layered the photo over the Doily Transparency--they're perfect for layering under photos. 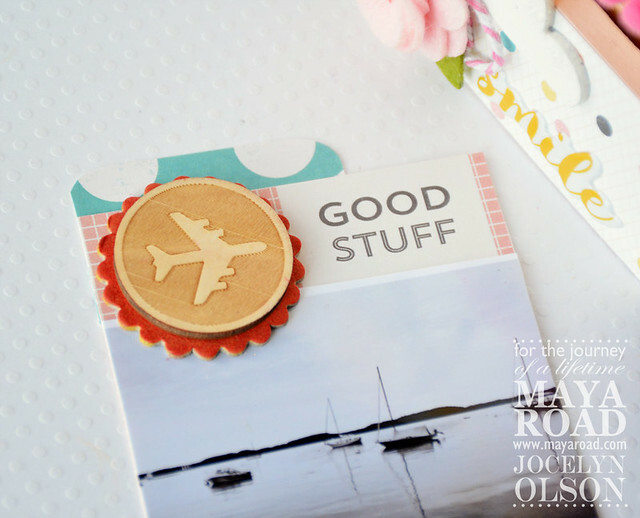 I inked the Mini Scalloped chipboard and layered the airplane Travel Token to pair with my Maine harbor photo. I journaled on the bag of this popsicle tag. The Wooden Tag is painted, and I layered the Tu-Tu Tulle flower over it. For this tag, I painted the Antique Ornate Frame and layered the Felt Flower over it. On this summer tag, I was inspired by the strawberries patterned paper. I painted the Mini Chipboard Button and gilded the cute Camera Clip. Lastly, I had to have a tag with the Oh Deer resin deer. I also used the Vintage Pearl Flower and Doily Transparency. Fun, isn't it? I could see this project being modified for a gratitude journal or holiday countdown, too.